Recipe Homemade Yogurt for Healthy Teeth and Bones. 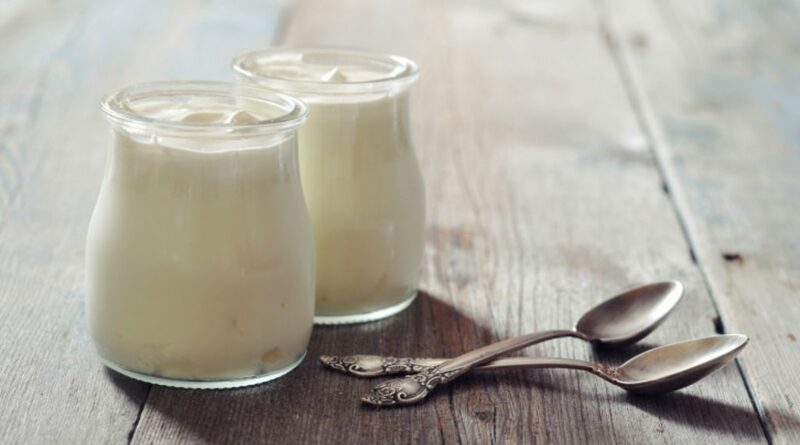 Learn how to create a starter culture and make delicious, creamy yogurt. Yogurt is one of the healthiest proteins to serve your little ones. Homemade yogurt is even better because it does not contain artificial flavors and additives. Yogurt is also an excellent source of protein and calcium, which result in healthy teeth and bones. If you want to protect healthy teeth for a lifetime, make sure you and your children are getting at least 1000mg of calcium a day. A single cup of yogurt contains half of the daily value! After the yogurt process is complete, you can add your own natural sweeteners like fruit and honey. Yogurt is comprised of many strains of bacteria and it can get confusing. Let’s start with the basics. Some strains of bacteria are heat loving and some are not. The type of bacteria starter you buy will determine the temperature you need to let it sit. The bacteria that is heat-loving (thermophilic) will want to sit at around 110 degrees. The bacteria that is “medium-loving” will want to sit around 70 degrees (mesophilic). If you are using yogurt from the store as a starter, make sure the yogurt label reads “contains live cultures”. Cultures for Health is a website online that offers thermophilic and mesophilic cultures. You can get them from all over the world and each have their own tartness/ sweetness. Which kind of milk should you use for healthy teeth? Non-homogenized, organic, grass-fed, no antibiotics. See more information here. Heat your milk to about 160-180 degrees (regardless of whether or not it is raw or pasteurized) and then pull it from the stove. Use a candy thermometer OR take it off the stove when it begins to froth. If the culture says thermophilic on the label, you will need to let it incubate. If you look at the yogurt and it has a gel consistency and does not move when you tip it slightly, the yogurt is done. Don’t let it sit too long or it will start separating. After you create the pure mother culture, you will mix the culture you just made with the milk (2tsp of culture to a cup of milk). If you use raw milk, you do not have to heat it to 180 degrees. If you are using pasteurized milk, you do need to heat it up to 180 degrees first before letting it sit. You then let the yogurt sit for 12-24 hours at 110 degrees. If you use raw milk, you do not have to heat it to 180 degrees. If you are using pasteurized milk, you do need to heat it up to 180 degrees. You then let the yogurt sit for 12-24 hours at 110 degrees until it becomes thick and creamy. That’s it! You are only one batch of yogurt away from healthy teeth and bones.